Can anyone recommend any Disney fiction books that are fun to read as adults? The Twisted Tales series looks good and I was intrigued by a Haunted Mansion series too. Anyone have any reccos or feedback? Thanks! Are you looking for fiction or non fiction? The Serena Valentino books aren't bad. Obviously the Imagineering book is amazing and a must-have for every Disney Parks fan. If you're not averse to comics, the two Dreamfinder and Figment mini-series they put out a few years ago are great. If you want to weep for lost treasures, the gigantic EPCOT book that was published right before the park opened is stellar. Also, there are great books about Mary Blair and also Attraction Posters. If you love the Haunted Mansion, there's the official book, which has amazing artwork and photos, and if you really want the nitty gritty, Jeff Baham's book. Realityland is a well-researched history of Walt Disney World that is also incredibly entertaining. There are lots more. Seems like people are interested in this Disney thing. I should have specified but I'm looking for fiction. This one? I've had it for years! But sorry I was actually looking for fiction books! PS. Did they make a sequel book to this? Yeah, they made an fantastic sequel! I actually don't have the one you have but I have seen videos of people flipping through it, and in my opinion, the sequel is just on another level. Not to say this one is poor by any means at all, but the new one feels so much more special in a way that you'll understand the moment you open it. 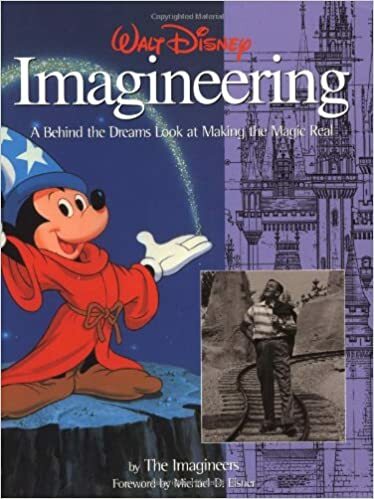 I believe the subtitle to the sequel is "A Behind the Dreams Look at Making More Magic Real"
Down and Out in the Magic Kingdom is a fun WDW-centered Sci-Fi novel. Not too long, either. The author is Cory Doctorow. He's great. Best part? He released the ebook version for free.